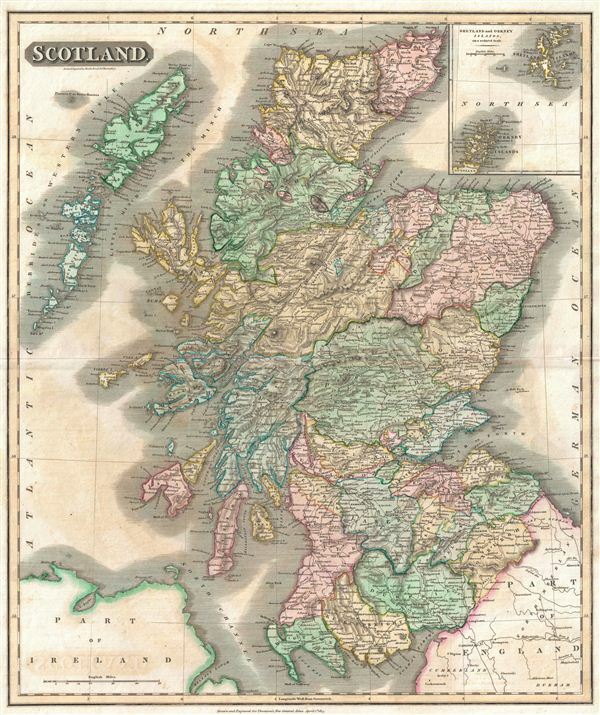 This beautifully hand colored 1815 map depicts Scotland at an interesting moment in its history. The United Kingdom and its allies had just defeated the Napoleon's French Empire, but the war had been so costly that the United Kingdom began to slide into a post-war economic depression. Scotland, home to a much more literate and skilled labor pool than elsewhere, reacted to particularly acute drops in wages with labor unrest that grew from 1815 to culminate in the Radicals' War in 1820. The map is beautifully engraved in the minimalist English style pioneered in the early part of the 19th century. Thomson maps are known for their stunning color, awe inspiring size, and magnificent detail. Thomson's work, including this map, represents some of the finest cartographic art of the 19th century. Relief is shown by hachure with towns, cities, and major topographical features identified. Issued in 1814 as plate no. 12 for Edinburgh cartographer John Thomson's 1817 New General Atlas. Rumsey 1007.012. Phillips (Atlases) 731. Newberry Library: Ayer 135 T4 1817.